GoodSearch Toolbar is a browser extension which travels bundled with search tools for your Internet Explorer and Mozilla Firefox browsers. You can install the add-on from goodsearch.com/newtoolbar/index.aspx. The application has been created by GoodApp and is published by Visicom Media Inc. You may already be familiar with this company if you have used such products as MyStart Social Toolbar or DealBrowsing. Like many of the recently presented programs, this extension can connect to the Internet without your consent, which sometimes may be quite dangerous. Luckily, you are not obliged to remove GoodSearch Toolbar or the related search results for virtual security reasons. If you choose to install GoodSearch Toolbar onto the browsers, you need to look for information regarding the aforementioned search tools. If you do not want to change the home page and the default search provider of your browsers to GoodSearch, you certainly are not required to. All you have to do is un-check the presented boxes before completing the installation. The search engine present such search tools as web, images, video, goodshop, goodswipe, goodgames, goodsurveys, goodoffers, goodtravel, etc. Note that this search engine will be presented to you if you use the search box attached to the toolbar as well. The GoodSearch toolbar itself presents easy-access links to the services of GoodShop, GoodCoupons, Amazon, eBay, Facebook and YouTube. Once you visit online shopping websites, you will notice that GoodCoupons light up indicating the number of available coupons which you supposedly could use to save money. 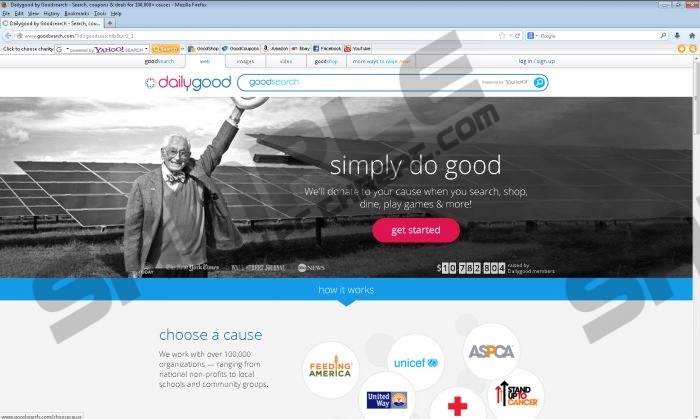 The toolbar also suggest supporting a specific cause. It is stated that you can donate money just by browsing, shopping or playing games via the toolbar and the search tools. In order to sign up for the service, you will be asked to login using Facebook, Google+, Yahoo or email. We do not identify GoodSearch Toolbar as a malicious extension; however, you may want to delete it. Some computer users choose to remove the plugin because of the advertisements which may be presented and because of the search tools which might have been installed accidentally. If you wish to delete GoodSearch Toolbar and the search tools manually – follow the guides presented below. If you are also looking for a tool which could help you protect the operating system, we suggest saving time and installing an automatic malware removal tool right now. A legitimate program will be able to identify and delete the toolbar, even if it is not dangerous to your virtual security. Open the Start menu by clicking the Start icon on the Task Bar. Choose the undesirable application and select Remove. Move to Uninstall a program and locate the undesirable software. Access the Metro UI menu and right-click anywhere on the screen. Select All apps, click Control Panel and then go to Uninstall a program. Find the program you wish to delete, right-click it and select Uninstall. Go to Toolbars and Extensions and Disable the undesirable items. Now move to Search Providers and select a new default search. Tap Alt+T once more and select Internet Options. Click the General tab, change/delete the Home Page and click OK. In the Add-ons Manager move to Extensions and Remove the undesirable plugin. Exit the tab. Simultaneously tap Alt+T to open the Tools menu and click Options. Move to the Firefox search box on the right and click the search provider icon. Select Manage Search Engines and Remove the undesirable option. Click OK.
Quick & tested solution for GoodSearch Toolbar removal.